Governor Proposes Changes to Healthy Families Program (HFP) to Yield Budget Savings. The Governor's 2012–13 budget plan proposes to: (1) reduce the negotiated rates paid to HFP managed care plans by 25.7 percent, on average, and (2) shift the children enrolled in HFP, which is administered by the Managed Risk Medical Insurance Board (MRMIB), to Medi–Cal, which is administered by the Department of Health Care Services (DHCS). The administration expects the proposal to yield net General Fund savings of $64 million in 2012–13. Governor's Proposal Has Merit, but Raises Issues. In this report, we provide background on Medi–Cal, California's Medicaid program, and HFP, California's Children's Health Insurance Program (CHIP). We find that the Governor's proposal has merit, but identify several budget and policy issues for the Legislature to consider. Specifically, the savings in the budget year may be less than the administration's estimates, and the proposal will disrupt healthcare services for some HFP enrollees and may impact access to providers. We offer an LAO alternative to the Governor's proposal—the early transition in 2012–13 of the subset of HFP enrollees who would be transitioned anyway to Medi–Cal in 2014 under federal health care reform. Our alternative would serve as a pilot test for the proposal to shift all HFP enrollees to Medi–Cal and would allow for full evaluation of the policy and budget implications of such a shift. We further recommend that the broader issue of the future of the HFP program be referred to policy committee. The Governor's 2012–13 budget plan proposes to: (1) reduce the negotiated rates paid to HFP managed care plans by 25.7 percent, on average, and (2) shift the children enrolled in HFP, which is administered by MRMIB, to Medi–Cal, which is administered by DHCS. The administration expects the proposal to yield net General Fund savings of $64 million in 2012–13. In this analysis, we provide an overview of HFP and Medi–Cal and describe their similarities and differences. The federal Patient Protection and Affordable Care Act (ACA), also known as federal health care reform, makes broad changes to the nation's health care system and we describe how it affects Medi–Cal and HFP. Then, we describe the Governor's proposal and find that it has merit on a number of fronts, including the creation of General Fund savings. However, we also raise several budget and policy issues in respect to the Governor's proposal for the Legislature to consider, and recommend an alternative to the Governor's plan. Medi–Cal Provides Medical Services to Low–Income Persons. In California, the federal Medicaid program is administered by DHCS as the California Medical Assistance Program or Medi–Cal. The Medi–Cal Program provides health care services to qualified low–income persons—primarily families with children, seniors, and persons with disabilities. In 2011–12, the administration estimates a total Medi–Cal caseload of 7.7 million beneficiaries. Federal law establishes some minimum requirements for state Medicaid programs regarding the types of services offered and who is eligible to receive them. Generally, each dollar spent on health care for a Medi–Cal enrollee is matched with one dollar from the federal government. Medi–Cal provides health care coverage through two basic types of arrangements—fee–for–service (FFS) and managed care. In a FFS system, a health care provider receives a payment from DHCS for each medical service provided to a Medi–Cal beneficiary. Beneficiaries generally may obtain services from any provider who has agreed to accept Medi–Cal patients. Under managed care, DHCS contracts with health care plans to provide health care coverage for Medi–Cal beneficiaries residing in certain counties. The DHCS then reimburses health care plans on a capitated basis. The health plans assume some financial risk, in that they may incur costs to deliver the necessary care that are more or less than the capitated rate. No insurance premiums are collected from Medi–Cal enrollees under either managed care or FFS. Even in counties with managed care, certain Medi–Cal services are provided outside the managed care system and these services are commonly referred to as "carve–outs." The Early and Periodic Screening, Diagnosis, and Treatment (EPSDT) program, for example, is a federally mandated set of services and benefits for all individuals under the age of 21 who are enrolled in Medicaid. The treatment component of EPSDT is broadly defined to include necessary health care, diagnostic services, treatment, and other measures that are needed to correct or ameliorate physical and mental illnesses and conditions discovered by the screening services. The counties administer EPSDT and services provided under EPSDT are paid for by the counties and the federal government, with costs split about evenly between them. The HFP Provides Health Insurance to Low–Income Children. The federal CHIP provides health coverage to children in families that are low–income, but with incomes too high to qualify for Medicaid. The HFP is California's CHIP and it provides health insurance for about 878,000 children up to age 19 in families with incomes above the thresholds needed to qualify for Medi–Cal but below 250 percent of the federal poverty level (FPL). (The FPL is $22,350 in annual income for a family of four.) For every dollar the state spends, the federal government provides roughly a two–dollar match. The MRMIB provides coverage by contracting with health plans that provide health, dental, and vision benefits to HFP enrollees. Under state law, the benefits that HFP provides to enrollees are required to be equivalent to benefits provided to state employees through the California Public Employees' Retirement System, with certain exceptions for mental health benefits. The HFP has a tiered premium structure that specifies lower premiums for families below 150 percent of the FPL, and higher premiums for higher–income families. These premiums can vary between $4 to $24 per child per month depending on family income, with a maximum monthly family premium of $72. As part of the 2011–12 budget plan, the Legislature approved premium increases for HFP, and at the time this analysis was prepared, MRMIB was awaiting federal approval to implement them. Families have copays that vary between $5 to $15 depending on the services rendered, with a maximum annual family copayment amount of $250. The state and federal government pay the remaining costs. As part of the 2011–12 budget plan, the Legislature approved copayment increases for HFP. However, the federal government has effectively denied approval for such increases through its recent denial of copayments for Medi–Cal. States Have Option to Combine Medicaid and CHIP Programs. A state may use federal CHIP funds to create a stand–alone program, such as HFP, or expand its Medicaid program to include children in families with higher income. In both options, states receive the two–dollar federal match for every state dollar to provide coverage for the CHIP population. The ACA also creates health care exchanges and gives the states authority to integrate CHIP into the exchanges. We discuss this later in this analysis. Medi–Cal and HFP Managed Care Benefits Are Largely Equivalent. According to information from DHCS, the managed care benefit packages are largely equivalent under HFP and Medi–Cal, with some differences. Vision benefits, for example, may be more comprehensive in HFP than Medi–Cal, as eye examinations, contact lenses, and glasses benefits are offered annually, rather than once every two years. On the other hand, there are some services, such as non–emergency medical transport and 24–hour shift nursing, which are covered by Medi–Cal and are generally not covered by HFP. Difference in Eligibility Criteria Between HFP and Medi–Cal. The HFP only covers children, while Medi–Cal covers parents and children. A child's eligibility for both programs typically depends on the age of the child and the income of the family, as shown in Figure 1. Generally, parents with income up to 100 percent of the FPL qualify for Medi–Cal along with their children. Children age 0 to 1 are generally eligible for Medi–Cal if their family income is below 200 percent of the FPL. Children age 1 to 6 are eligible if their family income is below 133 percent of the FPL. Children age 6 to 19 are eligible if their family income is below 100 percent of the FPL. 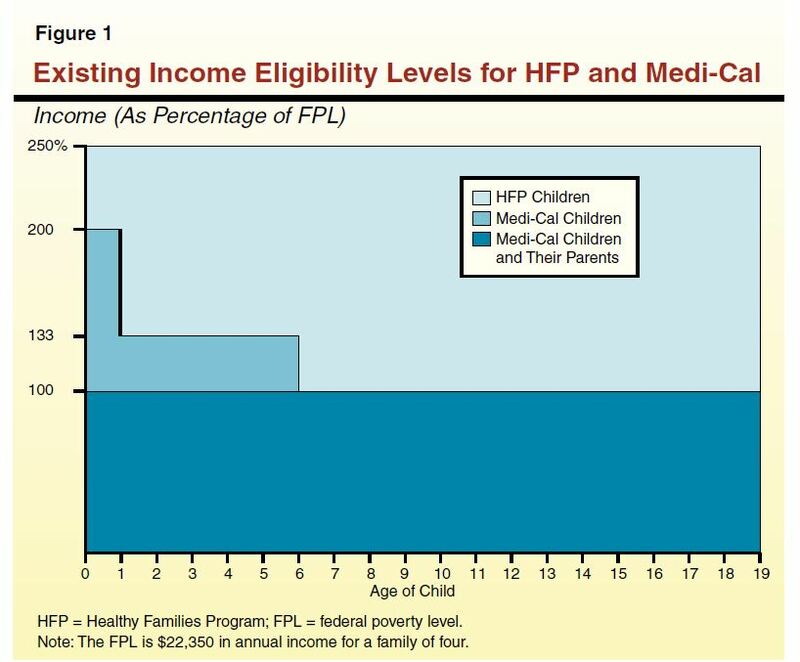 Accordingly, a family with income between 100 percent to 133 percent of the FPL may have one child who qualifies for Medi–Cal, and another older child who does not qualify for Medi–Cal, but does qualify for HFP. Differences in Access to Managed Care Between HFP and Medi–Cal. The HFP provides access to managed care in all 58 counties. While the Medi–Cal FFS system exists in every county, Medi–Cal managed care plans are in 30 of the 58 counties, as shown in Figure 2. About 56 percent of the Medi–Cal caseload is enrolled in managed care. Managed Care System Has More Oversight and Monitoring Than FFS. In contrast to managed care arrangements, the network of FFS providers is not regularly monitored and measured for quality of care and provider network adequacy. The managed care plans undergo quality reviews conducted by DHCS and MRMIB. In addition, most Medi–Cal managed care plans and all HFP plans are regulated by the Department of Managed Health Care, which monitors financial solvency, evaluates provider network adequacy, conducts quality performance audits, and responds to beneficiary grievances. Information on plan performance metrics is available to the public. The ACA makes broad changes to the nation's health care system including changes to Medicaid and CHIP. Among these changes, it expands Medicaid eligibility for parents and children and offers financial assistance, in the form of subsidies, to purchase health coverage for individuals with income too high to qualify for Medicaid. Expanded Medi–Cal Eligibility Up to 133 Percent of the FPL. The ACA significantly expands the Medicaid program primarily by extending coverage to certain population groups not previously eligible. Beginning January 1, 2014, federal law will extend Medi–Cal coverage to families with incomes at or below 133 percent of the FPL, regardless of the age of the children. Currently, there are about 186,800 children age 6 to 19 with family incomes between 100 percent and 133 percent of the FPL who are enrolled in HFP. These children will shift from HFP to Medi–Cal on January 1, 2014, unless they shift at an earlier time. Subsidized Coverage Offered in the Health Benefits Exchange. The ACA creates new entities called Health Benefit Exchanges through which individuals who generally do not have access to affordable employer coverage can purchase coverage. This includes parents who currently have children in HFP or Medi–Cal. Citizens and legal residents with incomes between 133 percent and 400 percent of the FPL are eligible for a federal premium subsidy to help them purchase coverage through the exchange. Persons with incomes up to 250 percent of the FPL will also be eligible for reduced cost sharing, such as lower deductibles and copayments, with the amount of the reduction varying based on their income. The HFP Under the Exchange. The state could keep HFP but have it administered by the exchange. Alternatively, the ACA includes provisions that allow states to enroll CHIP–eligible children into plans offered through the exchange, under certain conditions including: (1) the children are not Medi–Cal eligible and (2) the plans available through the exchange provide benefits and limits on cost sharing comparable to those provided through HFP. A rationale for giving states this option is that allowing HFP children to enroll in plans offered through the exchange would permit them to be in the same plan with their parents. The Governor's budget plan proposes to: (1) reduce the negotiated rates paid to HFP managed care providers by 25.7 percent, on average, effective October 1, 2012 (bringing these rates to Medi–Cal levels), and (2) shift approximately 878,000 children enrolled in HFP to Medi–Cal by June 30, 2013. The budget assumes that this would result in net savings of $64 million General Fund in 2012–13 and full year annual savings of $91 million in 2013–14. (The net savings of $64 million General Fund assumes $71 million in General Fund savings from lower HFP managed care rates partially offset by administrative costs, loss of premiums paid by certain HFP enrollees, and other factors.) The federal matching rate of two federal dollars for every one state dollar spent on HFP enrollees would remain the same, but General Fund support would shift from MRMIB to DHCS. Phase 1 (October Through December 2012). Beginning October 1, 2012, about 411,000 HFP enrollees who are enrolled in a HFP managed care plan that also directly contracts with Medi–Cal would stay in the same plan and transition to Medi–Cal. Phase 2 (January Through March 2013). Beginning January 1, 2013, the remaining 424,000 HFP enrollees who live in a county with an existing Medi–Cal managed care plan would transition into those plans. Some HFP enrollees would stay with their managed care plan if it is a subcontractor to a Medi–Cal plan. Other HFP enrollees would shift into a new managed care plan. Phase 3 (January Through June 2013). Beginning January 1, 2013, the remaining 43,000 HFP enrollees who live in a county without an existing Medi–Cal managed care plan would be transitioned into FFS Medi–Cal. 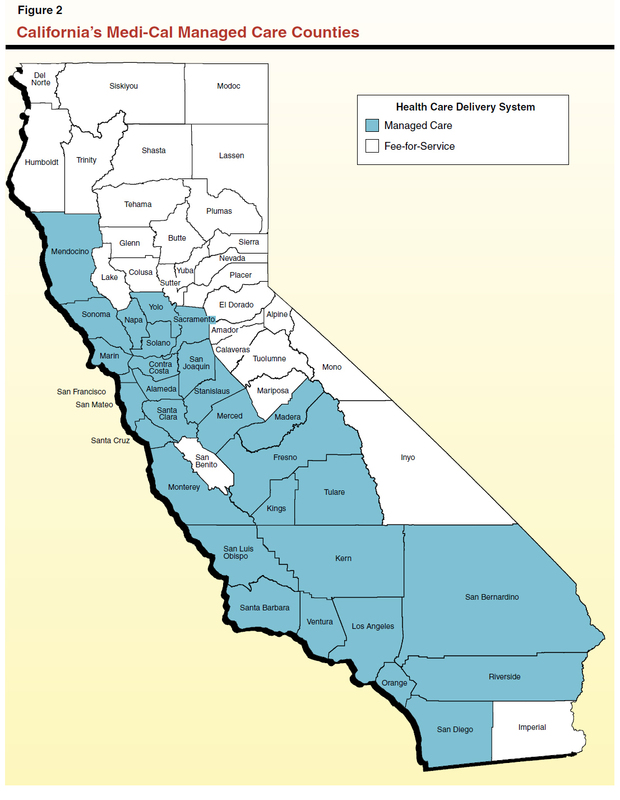 Expansion of Medi–Cal Managed Care Into All 58 Counties. The Governor's budget separately proposes to expand Medi–Cal managed care into the 28 counties which currently have only FFS Medi–Cal. This expansion would begin in June 2013, six months after the first HFP enrollees would be shifted into FFS under the Governor's plan. Governor's Proposal Has Merit . . . The Governor's budget proposal has merit because, in addition to creating significant General Fund savings, it would provide greater continuity of coverage for some families and implement early some of the program changes required by the ACA. Consolidating State Health Programs Would Improve Continuity of Care. The consolidation of HFP into Medi–Cal would reduce the number of state children's health insurance programs. This would provide more continuity of care for families whose eligibility for Medi–Cal and HFP may change from year to year based on varying income levels. It would also provide more continuity of care for families who have one child currently enrolled in HFP and another child enrolled in Medi–Cal because all the children could be enrolled in the same plan together. Proposal Would Implement Some ACA Requirements Early. 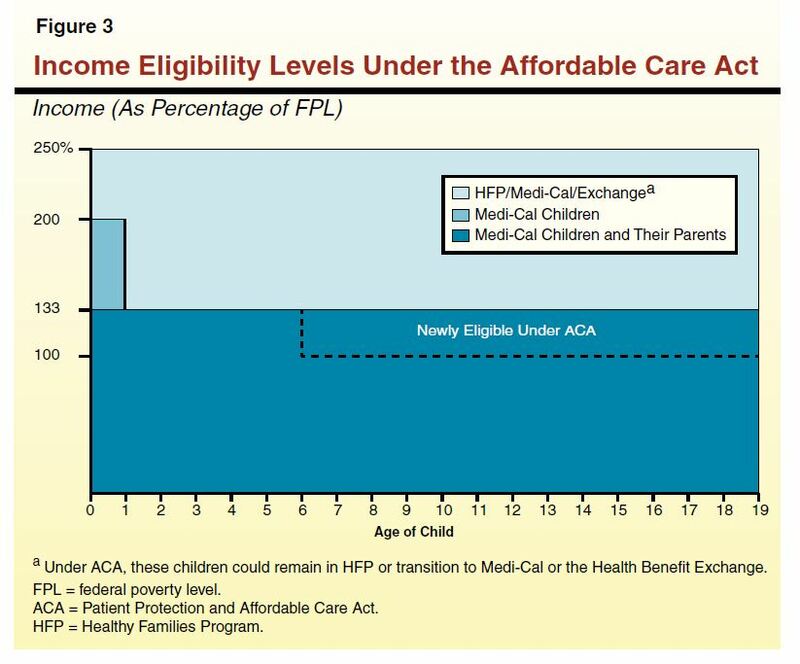 A portion of the HFP enrollees who would transition to Medi–Cal—those children in families with incomes below 133 percent of the FPL—would have been required to transition into Medi–Cal by 2014 under the ACA. Given the substantial number of actions needed to successfully implement ACA, it makes sense to begin implementing federally mandated changes prior to the required date. While the proposal has merit, there are several major budget and policy issues the Legislature should consider, which we discuss below. Administration's Estimated Savings in the Budget Year May Erode. The administration's estimated budget–year savings are built on the assumption that MRMIB will successfully reduce the reimbursement rate of plans that it contracts with by 25.7 percent, on average, by October 1, 2012. Under this assumption, rates would decrease from an average of $103.44 per member per month to $76.86. It is unknown how many health plans will be willing to continue to contract with MRMIB for HFP at this reduced rate. The administration's estimates of the savings that can be achieved by negotiating lower rates with managed care plans is uncertain because it depends on the outcomes of a series of negotiations. If MRMIB is unable to negotiate any lower rates with managed care plans, the state could still achieve some partial–year savings in 2012–13 resulting from the shift of HFP enrollees into Medi–Cal. This is because the average rates paid to Medi–Cal managed care plans are generally lower than the average HFP rates for a largely equivalent package of benefits once they are adjusted for carve–outs. The savings from the shift would be greater in 2013–14 because the state would get full–year savings for the children who shifted. The full–year savings are estimated at $91 million from the General Fund. Healthcare Services for Some HFP Enrollees Will Be Disrupted. The transition of children from HFP to Medi–Cal would disrupt some enrollees' healthcare services. This disruption could be particularly damaging to any HFP enrollees who have chronic or complex health conditions. A little under one–half of the children enrolled in HFP, or 47 percent, are enrolled in a managed care plan that also contracts with Medi–Cal. These enrollees would likely stay with the same primary care physicians and experience minimal disruptions to care. A little under one–half of the children enrolled in HFP, or 48 percent, would remain in a managed care plan but might switch plans and primary care providers. Approximately 5 percent of HFP enrollees—those who live in areas where Medi–Cal managed care is not available—would initially transition from their managed care plans to the Medi–Cal FFS system. Since quality and access to FFS care is not systematically measured, it is difficult to determine whether these children would receive equivalent care after they are shifted into FFS. In the long term, the Governor's proposed expansion of Medi–Cal managed care to all 58 counties would ensure that all HFP enrollees would be enrolled in managed care. In the short term, however, 43,000 children may be transitioned from HFP managed care plans to Medi–Cal FFS by June 2013, and then transitioned again from Medi–Cal FFS to Medi–Cal managed care plans. This movement from managed care to FFS and then back to managed care would disrupt continuity of care, potentially adversely impacting health outcomes for these children. The Proposal May Impact Access to Providers. While the benefits offered under HFP and Medi–Cal are largely equivalent, the access to providers may differ between the two programs. One survey found that when pediatricians who currently see patients enrolled in HFP and Medi–Cal were asked if they would continue to see HFP enrollees after they were transitioned to Medi–Cal, 51 percent replied that they would, while 19 percent replied they would not and 30 percent were unsure. Of pediatricians who currently see patients enrolled in HFP, but not Medi–Cal, 26 percent responded that they would be willing to enroll in Medi–Cal to continue to see those patients, 29 percent said they would not be willing to enroll in Medi–Cal, and 46 percent were unsure. Some pediatricians surveyed expressed concerns regarding differences between HFP and Medi–Cal in terms of rates, administrative procedures, and access to federal vaccine programs and drug formularies. Overall, the impact of the Governor's proposal on the provider network and beneficiary access to services is unknown, but there would likely be some pediatricians who currently serve HFP enrollees who would not serve these children once they transitioned to Medi–Cal. Proposal Should Be Considered in Context of Healthcare Reform. The ACA provides an opportunity for the Legislature to reexamine the structure of the state's health programs. Under ACA, children and adults below 133 percent of the FPL will be eligible for Medi–Cal, and most adults with incomes between 133 percent and 250 percent of the FPL will be eligible for premium subsidies and cost–sharing assistance through the exchange. The new eligibility rules under ACA are illustrated by Figure 3. With ACA, the state will now have the option to locate its CHIP program in three different places: a stand–alone HFP, an expansion of Medi–Cal, or within the exchange. The Governor's proposal would provide coverage for children in families with incomes below 250 percent of the FPL through Medi–Cal. While there are merits to this policy proposal, as we have discussed, it may result in cases where children are in Medi–Cal plans and parents are in different plans purchased through the exchange. The Legislature should carefully consider the future of children's health coverage in the context of ACA. Shift Select Portion of HFP Enrollees to Medi–Cal in 2012–13. Transition only the 186,800 children in families with incomes between 100 percent and 133 percent of the FPL from HFP to Medi–Cal in 2012–13. This is the portion of the HFP population that would shift anyway to Medi–Cal on January 1, 2014 pursuant to ACA. This transition would serve as a pilot program and allow the Legislature to monitor and evaluate the transition's effects on continuity of care and changes to provider networks. Direct MRMIB to Report in Legislative Hearings on Transition Options. Direct MRMIB to report in budget or policy hearings on the benefits and the trade–offs of transitioning 186,800 HFP enrollees concurrent with their annual eligibility review rather than on the three–phase schedule proposed by the administration. Refer Discussion of Future Structure of HFP to Policy Committee. Refer to the health policy committees the discussion of whether HFP should continue as a stand–alone organization, whether all HFP enrollees should be transitioned into Medi–Cal, and whether CHIP services should be provided through the exchange. We believe the policy committee process is the appropriate venue to evaluate these issues because they have broad implications for access to care and continuity of care that reach beyond the budget. Direct MRMIB to Report at the May Revision on Rate Negotiations. Given that the Governor's target of a 25.7 percent reduction in rates is very aggressive, MRMIB should report back to the appropriate budget committees in May on the likelihood of achieving savings from this rate reduction target. Fiscal Impact of LAO Alternative. If MRMIB is able to reduce the average rate paid to HFP plans to be equivalent to Medi–Cal levels when adjusted for carve–outs (as is assumed by the Governor's proposal), then our alternative would achieve the same level of budget–year and future–year savings assumed in the Governor's budget. This is because the state would be paying the same amount for children's health insurance whether children are enrolled in Medi–Cal or HFP. If, however, MRMIB is unable to reduce rates to Medi–Cal levels, then our alternative would yield fewer savings than the Governor's proposal. This is because the Governor proposes to shift a larger portion of the HFP enrollees to Medi–Cal in the budget year than under our alternative, in effect providing a relatively greater guarantee of achieving the assumed level of budget savings. Our alternative trades off this relative guarantee of budget savings with the benefit of proceeding in a manner that would allow full evaluation of the policy and budget implications of shifting all HFP enrollees to Medi–Cal. DHCS to Report on Feasibility of Maintaining Some Rural HFP Plans. Direct DHCS to report at budget hearings on the feasibility and associated costs and benefits of maintaining contracts with HFP providers in Medi–Cal FFS counties until Medi–Cal managed care is expanded into those counties. DHCS to Report on Feasibility of an Exception Process. Direct DHCS to report at budget hearings on the feasibility of creating an exception process to the proposed transition of HFP enrollees to Medi–Cal for children with chronic and complex health conditions to ensure that their health is not adversely impacted by a disruption to continuity of care. Under such an exception process, DHCS would ensure these children continued to receive care from their existing HFP health plan until a seamless transition plan could be put in place. Acknowledgments. This report was prepared by Janne Olson-Morgan, and reviewed by Shawn Martin. The Legislative Analyst's Office (LAO) is a nonpartisan office which provides fiscal and policy information and advice to the Legislature. LAO Publications. To request publications call (916) 445-4656. This report and others, as well as an E-mail subscription service, are available on the LAO's Internet site at www.lao.ca.gov. The LAO is located at 925 L Street, Suite 1000, Sacramento, CA 95814.